The mere mention of the term 'Chest Expander' draws confused frowns from most of you all, practically telling me to question my sanity. Who even uses these primitive pieces of equipment today? Seriously? Who would even be ready to get insulted in a party claiming about how they could just do a front chest pull with another spring added, for reps? 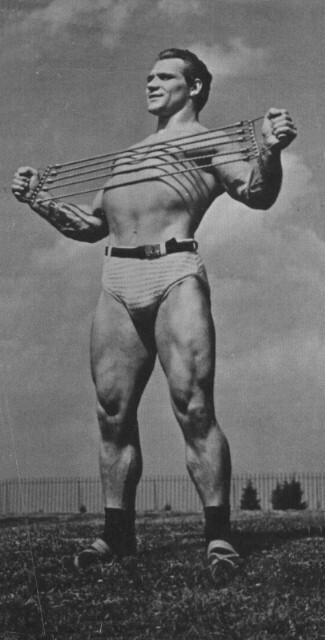 Aside from being used as an exercise equipment, a chest expander, or Strands, as they were more popularly known as in the old time British and German strength training circles were mostly used to demonstrate feats of strength and stunts. 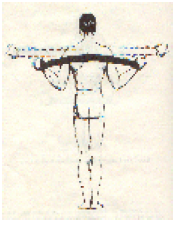 Let me set the stage for this formidably simple invention in exercise science almost a century old now. I have spent the last few months incorporating it with my usual weight training workouts. During my travel, chest expander workouts were the only stuff I did, along with very few bodyweight drills. And this has been one of the smartest decisions I have made in my training lately. Inclusion of cable based training has resulted in visible changes in my upper body muscularity as told by multiple friends. And all of that when I am only using two 20 minute something sessions a week, alternated with my usual barbell lifting course. 5. Continuing on point 4, an expander hits deeper muscles of your back which are often not worked by conventional free weights. Now, this doesn't mean that all merits of free weights can be undermined. The optimum approach would be to integrate some select movements done on an expander or cables along with your free weights during your regular workouts. While on the road, you can still continue your expander movements, even if you aren't lucky enough to get a hotel gym. But, it's just a CHEST expander, right? What about the rest of my body? Old time strongmen (the ones who lived in the age of real strength and health, preceding the 1950s) termed the entire circumferential girth of the upper body, including, the latissimus dorsi, mid back and the pectoralis muscle groups as the CHEST. This also included the amount of expansion gained by the rib cage, often as a result of deep breathing. Training with an expander resulted in tremendous gains in these measurements. Hence the name. And yes, you can, as we shall see, train the rest of the upper body, back, shoulders, arms and forearms in an excellent fashion using a chest expander. While the expander has been around since almost a century now, what made it really fade away into the dark background? I'm not totally sure, but it has to do with the fact that it puts an end to a lot of business opportunities of fitness equipment manufacturers. I mean, who would really buy an elaborate multi gym set up for their home when they get to know that they can do a significantly huge set of exercises with just a set of springs attached to a wooden handle? What makes springs and cables so special? Or so Different? "Okay, tell me more about this gimmick of yours." While being around for nearly a century certainly pulls it out from a gimmick list, what does make an expander special is its ability to provide progressively greater resistance as its length increases during a repetition. In other words, the longer you pull it, the more resistance it provides. As you keep getting better at an exercise, keep adding reps. And then, cables or springs depending upon which design you're using. When that expires, use springs of higher tension to add resistance. So, you see, it's THAT simple to keep upgrading the challenge levels with this deceptively simple exercise equipment. No gigantic weight plate stacks needed. "Alright, I'm sold. Tell me more about it." While there are almost dozens of exercises that can be done with a chest expander, there are a some timeless classics that have been creating stronger bodies since ages. "How many reps do I do here?" For a pure strength emphasis, a couple of sets of 6 to 8 reps usually work the best. But looking at often how the maximum resistance of a chest expander is limited by the number of springs that are possible to get attached, very few trainees would use an expander for pure strength work. 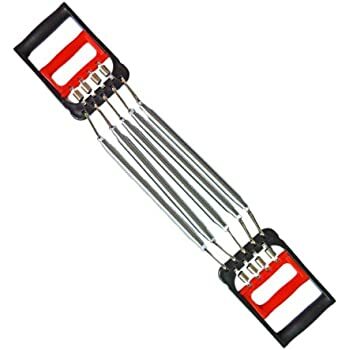 Thus, for using an expander for the very purpose it works the best for, muscular hypertrophy, a wide range of 8 to 15 reps and a couple of sets works great. With the expander in your arms raised overhead, pull the handles outwards with the elbows STRAIGHT till the springs get fully stretched and are touching your mid back at the bottom position of the exercise. Hold the expander in front of you, pull apart the handles, leading with the elbows till the arms are completely straightened as the springs get outstretched horizontally to their maximum limit. Hold the expander behind your back with both hands and press the handles out until the arms are straightened fully and the springs are stretched to a high degree of tension. Just like exercise no 1, hold the expander in front of you, though this time, instead of pulling, PRESS both arms outwards till they are fully straight and the cable is stretched to a high degree of tension. remember, although the finish position of this exercise looks like exercise no1, do not confuse the two. This is a PUSH and not a PULL. Pretty self-explanatory. Anchor one handle of the expander below your right leg while working the right arm. Pull the other handle with the right arm flexing your elbows till the handle almost touches your shoulder. Repeat on both sides. Similar to exercise 5, just pronate your hands, or turn your knuckles up while curling the handles. One of the most staple movement that can be done on an expander. Hold the expander in front of you with both hands while one arm being fully extended while the other bent at the elbow. From here, pull the handle with the bent arm till it is fully stretched while keeping the other arm stationery. Repeat with both arms. This one's a tremendous tricep builder. 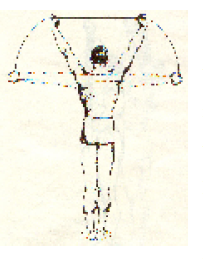 The finished position of an Archer's movement resembles that of Exercise 1. Lock one handle of the expander by the side of the hip and position the other one near the opposite shoulder. This should resemble the bottom position of a military press. From here, press this arm up till fully extended. Repeat with both arms. Outstretch the expander in front of you with both the hands, with the arms hanging straight. From this position, stretch the spring by flexing and extending the wrist, while maintaining the tension on the springs at all time. The range of motion will be very less here. This exercise can be done by keeping the expander both in your front as well as the back. inward. Stretch the expander laterally to arms’ length, then bring arms forward, resisting the cables with your neck. Once you get the hang of this exercise, it becomes a tremendous neck-builder. While this is by no means a complete list of exercises possible and the possibilities are as many as one's imagination can allow, these are still a great start. It does come with one limitation that you cannot train the lower body on it with really enviable intensity. But hey, you cannot get everything, right? Besides, it's best in my experience to use Exapanders as an addition to a free weight program based on squats and deadlifts. The only lower body-ish dill I did with the expander was a cable resisted supine hip bridge of sorts. The bands had to be really fastened into place using the hands and making them stay on the ground was a real struggle. defeating the stability needed to perform a really stiff hip bridge. Nevertheless, it did provide a significant degree of resisted hip extension. Start reaping the benefits of training with springs, cables or resistance bands to fill in the gaps in your strength formed after following only a conventional free weight lifting program for years. Just pack it in your bag and you will never be disappointed with your training on the road. And though it goes without saying, Expander workouts are as beneficial to women as they are to men. Strandpulling workouts do not need to be boring. Make them fun variations, or often even challenge based sessions to strike an interesting break to your usual training. Enjoy your new found upper body muscularity, thanks to a century old, almost forgotten tool.